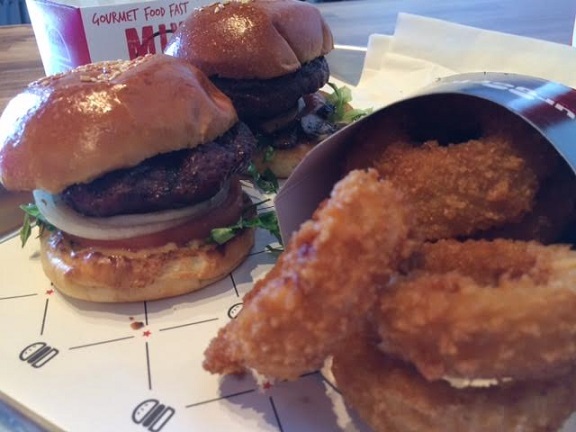 “Always more than one” is the motto of this burger chain, a sort of modified Lay’s slogan, and that’s because they specialize in “mini-burgers,” sold in twos or threes rather than individually. They’re a little bigger than sliders but smaller than a regular burger. 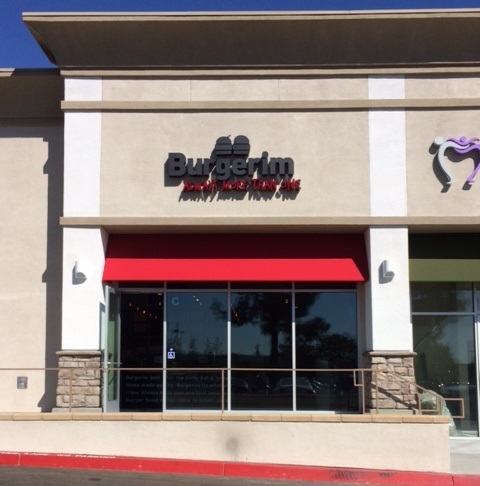 It’s a worldwide chain with 200 locations in 16 countries, based in Israel, but there’s only one other one in Southern California. (It’s in Hollywood, with Montclair being the obvious next step *cough*.) More are said to be coming. I wonder what their supply chain is like; maybe everything is airlifted in and dropped by parachute. There are 10 types of burgers including beef, turkey, lamb, chicken, chorizo and salmon. A duo is $10, a trio $13, and come with fries (regular, sweet potato or home) or salad plus soft drink; a la carte is $1 less, onion rings are $1.50 more. Burgers come with lettuce, tomato, onion and house sauce, and for 50 cents each you can customize it with nine toppings: egg, cheese, bacon, etc. The menu also has three non-burger sandwiches, four salads and three desserts, plus beer and wine and a Coke Freestyle machine. 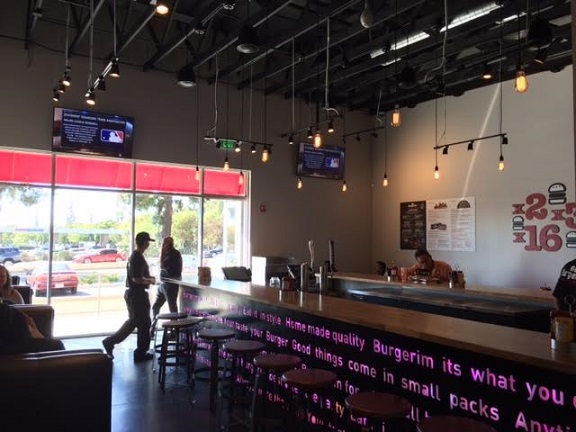 The interior is different than a typical fast-casual place: Edison lights, a three-sided counter/bar and then tables and booths along the walls. I got a Wagyu with mushrooms and a merguez (a spicy beef) with cheddar, plus onion rings. (So, typically $13.50: $1 extra for Wagyu, $1 extra for two toppings and $1.50 extra for rings.) The sandwiches arrive in a cute box and on seeded buns. The sandwiches are tidy, the patties tightly packed, and at 2.8 ounces, two made for a satisfying meal. The kitchen forgot the cheddar, by the way, but as I hadn’t paid 50 cents for it, I didn’t send it back. I suspect that few, including me, would be able to discern the difference between beef, Wagyu beef and dry-aged beef, to name three of the choices, but you’re welcome to try. The veggie patty is said to be better than usual with green onions, carrots, tofu and lentils. There’s not much that’s Israeli about the menu, although the panzanella salad ($9), with arugula, tomatoes, radishes, red and green onions, kalamata olives, basil and croutons was described to me as their take on an Israeli chopped salad, and merguez was described as a Mediterranean chorizo. 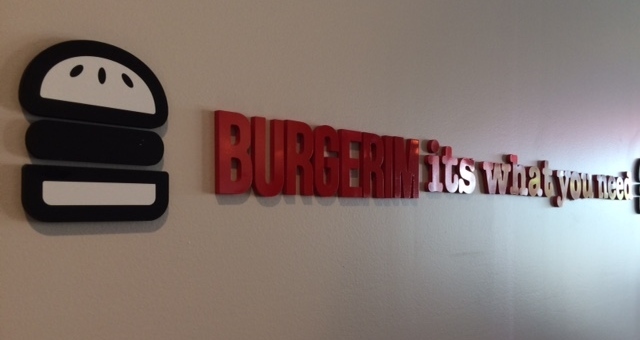 It’s an interesting concept and a little different than other local burger spots. This entry was posted in Restaurants: Montclair and tagged beer, hamburgers, restaurants by David Allen. Bookmark the permalink. Sounds interesting! I’ll try it soon. I think merguez refers to the types of spices and seasonings, because I have some merguez lamb sausage in my freezer from Whole Foods. How spicy was it? My coworkers and I ate there a few days after you did. While we enjoyed it, we did have a comedy of errors with our orders (I just chalk it up to a newly opened restaurant). I also ordered the onion rings (which were really good) but they gave me fries, so they took my whole tray back with my burgers and brought it all back a few minutes later. My coworker had ordered a Wagyu with cheddar and a beef with an egg. When he went for his Wagyu, incredibly it was missing the whole Wagyu patty! They took his whole order back as well, returning it a few minutes later. When he went to eat the beef with the egg, it was missing the egg. Repeat the process. All in all, we enjoyed our meal, it was just funny that everything that was ordered with an up-charge was not provided to us the first time around. Sounds like you’re a patient, good-humored crew. Your co-worker’s Wagyu with cheddar came without the Wagyu; mine came without the cheddar. Between us we had a complete sandwich. Interesting about your preference of the beef over the more expensive Wagyu. I didn’t have beef to compare my Wagyu with but didn’t find the Wagyu on its own worth the extra buck. I had lunch there today, and they may not be full-sized burgers, but two of them plus fries is a whole lot of food! I had the lamb and the merguez, and enjoyed them both a lot. I had the sweet potato fries, and they were very good. I wasn’t sure the lamb burger really tasted like lamb, and after reading Eric’s experience, I wonder if it actually was? The only upcharge I had was grilled onions instead of raw on both burgers.I’d definitely go back, but next time I’ll take one burger home for dinner. At least you get a box so you can easily take one sandwich home if you like.